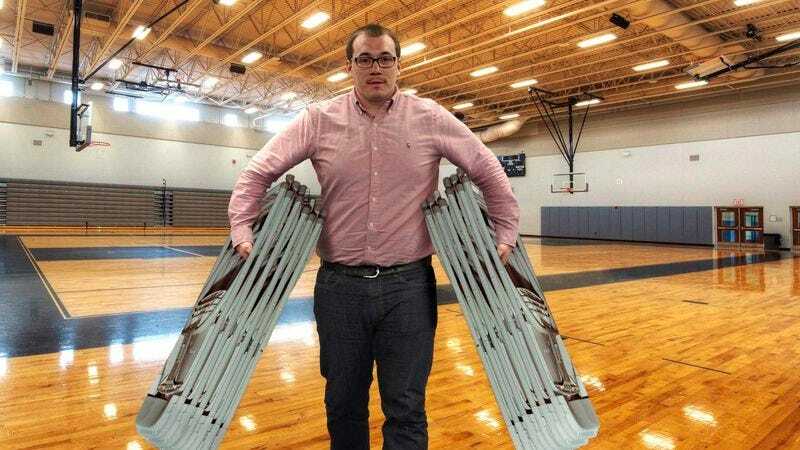 TALLAHASSEE, FL—Looking visibly flushed as he hurried across the gymnasium floor, local teacher Greg Tollefson reportedly hoped that everyone helping to clean up after Thursday morning’s assembly at Mangrove Hills High School would notice how many folding chairs he was carrying at once. “You can just leave those there—I’ll come back and get the rest,” said Tollefson, hoping that his addition of a fourth folding chair to the three already secured under each of his arms would be seen and admired by all. “Yeah, I got it. You guys can focus on packing up the AV equipment.” At press time, sources confirmed that Tollefson was fairly certain that at least a few people had noticed he had chosen the heavier metal chairs over the plastic stackable ones.